I unwittingly seem to have committed a sin against Korean table manners. My friend calls and asks if I’ve ever had Korean food. I hadn’t. “Wanna try it?” Sure. There was a little Korean restaurant down the street that I always passed by without paying much attention to outside of noting its existence every time I got my brows waxed at the salon next door. “I wonder if anybody eats there?” I would wonder on my way in to be made beautiful by torture. When we arrived the place was still and empty save for the television on the wall and a young couple sitting at the bar waiting for their take out order. A woman appears from the back and advises us to seat ourselves and returned to the back just as quickly as she appeared. On the walls by the table are lunch and dinner specials written in Korean and we decided that even though it was empty now, they must have a pretty heavy lunch rush. The hostess returns with two one page menus pointing out the appetizers on one side and dinner entrees on the other while suggesting “most people choose 1, 2 or 3. Lots of meat!” she advises with a wink and a smile and left to fill our drink orders. “Oh she seems nice” I say to my friend. 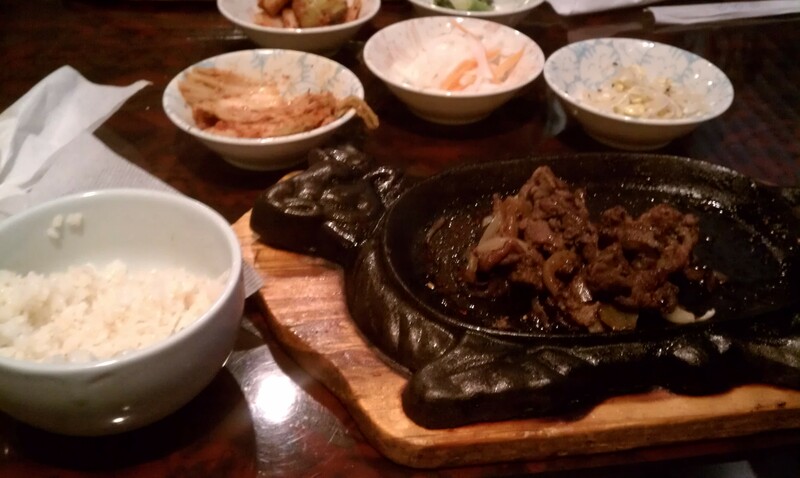 “I half expected a ‘what do YOU know about Korean food’ look when we came in.” We both decide on the Bulgogi. I because it is the only dish whose name I recognize and she because she is still looking for the best Korean place in the area. We chat while waiting for our meals. Notice the drums, guitars and microphone on one end of the building and wonder if the karaoke here is done only in Korean. Neither of us has the courage to come back to find out. Do you have any Mary J? Our meals arrive and the lady proceeds to lay out a million tiny bowls with small portions of kimchee, soybeans, rice, broccoli and some other foods I didn’t recognize. Feeling my space crowded by these too many bowls I begin to rearrange them. The bowl of rice is sitting on the edge of the table and I push it over to my right, concerned that it will fall off the table. Abruptly she stops. All previous pleasantness gone she eyes my hand on the bowl and yells “RICE GOES ON LEFT!” and puts the rice back in its original position. I unwittingly seem to have committed a sin against Korean table manners. My eyes wide from my scolding I look across the table at my dinner companion like “Did that just happen?” She stifles laughter and I promptly notice that her rice bowl is correctly in place to the left of her dinner plate. I narrow my eyes at her. Did she set me up? “For Korean dinner, “ her voice brought back down to a normal speaking tone “…rice bowl always goes on left.” How was I supposed to know this? She didn’t seem so nice to me anymore. Later on during dinner, a few grains of rice flew off of my chopsticks and landed on the floor. I was terrified that the rice-on-left lady would come back and reprimand me for my careless American chop sticking. I kicked them under the table to hide them as she arrived to refresh our drinks until I could pick them up without her noticing. My friend was in stitches. “Can I get you anything else? Dessert?” she smiled and asked. Just the check ma’am. Previous Previous post: BEWARE THE IDES OF MAR……no? Not yet? Good thing you didn’t do anything else embarrassing like pack that leftover meat in the same container as the rice. What could be worse than getting scolded while eating out? Unless it’s having your eyebrows waxed. True. But I’d take the scolding over the waxing – a necessary evil! Thanks for commenting bronxboy55! No problem! I enjoyed it! God only knows! Thanks for stopping by!